Narrowing of the entrance to the upper esophagus, at the junction of the throat and esophagus. Hypopharyngeal stenosis is a possible but uncommon complication for individuals with larynx or pharynx cancer who undergo radiation therapy as part of their treatment regimen. Panoramic view of the larynx, with the swallowing “crescent” in the middle of the view (indicated by the dotted lines). Several months prior, this patient had laser resection for hypopharyngeal cancer. 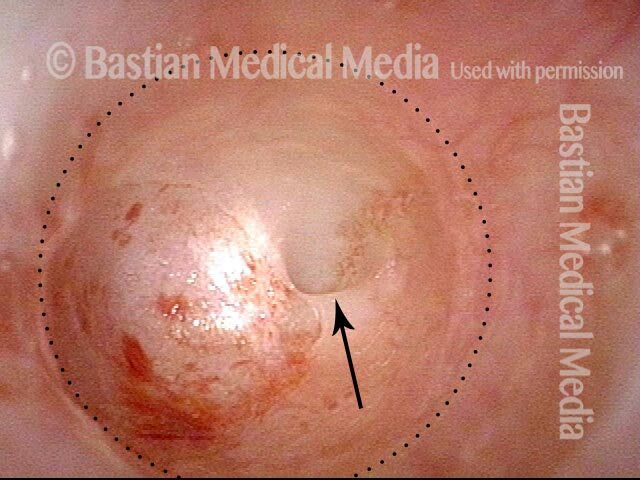 Expected scarring from the surgery led to a stenosis (that is, a narrowing) at the entrance to the esophagus. 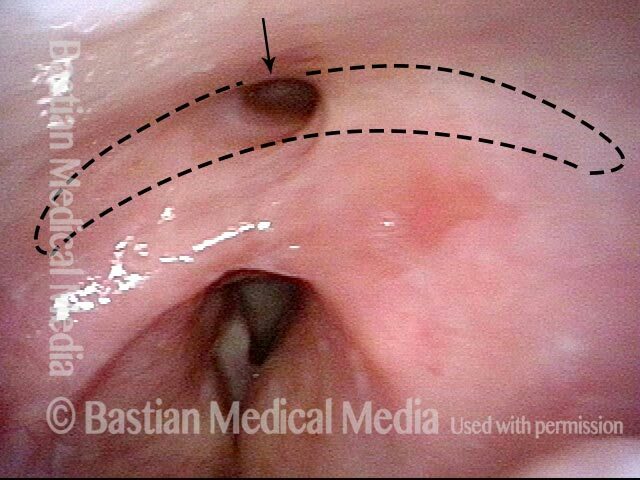 The stenosis cannot be seen here, but is revealed in the next photo (for reference, an “X” marks the same point in the larynx in both photos). 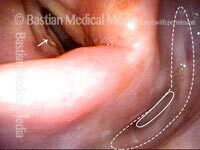 The patient performs the trumpet maneuver, which splays open the hypopharynx, revealing the stenosis; the dotted lines represent what would be a normal-sized opening. This stenosis affects swallowing of solid food, but the patient says this is no problem for him, if he eats a little more slowly and chews well. Early after radiotherapy for left vocal cord cancer (indicated by arrow), tumor seems to have responded, but it has become difficult to swallow solid foods due to a radiation-induced stricture (indicated by solid oval) with expected lumen (indicated by the dotted lines). 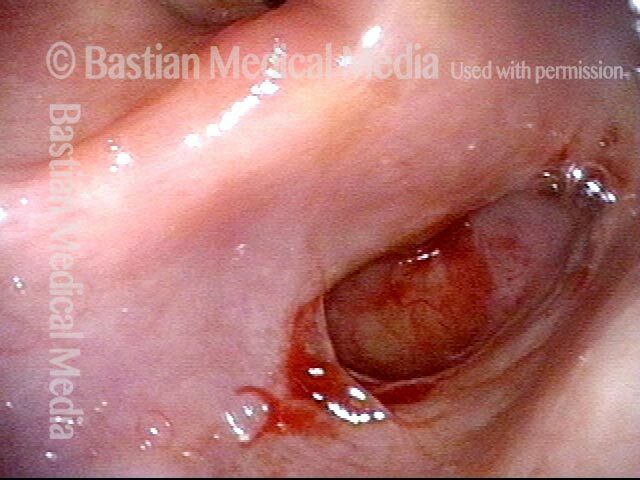 Closer-range view of the stricture at opening to the esophagus. A tapered device used for dilation (bougie) is now inserted into the stricture and down into the upper esophagus in order to enlarge the entrance to the esophagus. Immediately following dilation, the opening is enlarged (compare with photo 2). The patient’s ability to swallow food improved noticeably, but not to normal.